shows item 101 which is the exact sake cup in your family possession. 5. Do not help others to drink-although no objection with women"
direct link to the noble ronin of Ako. 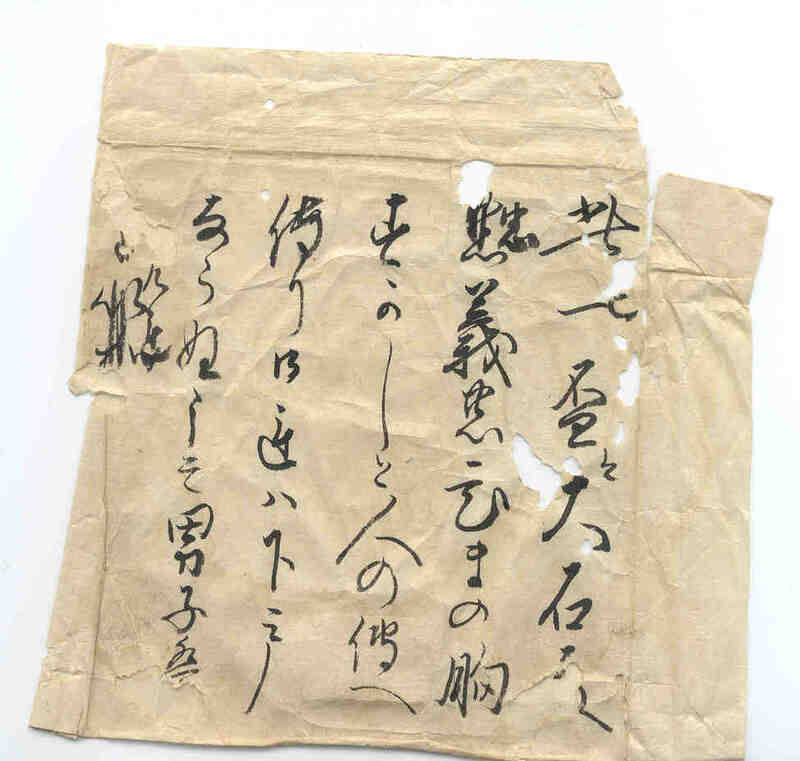 (2) the samurai featured, is reading a government decree which is posted on a wooden board. The first character is read as SADAME, which is translated as law or regulations which warn men against debauchery. I suspect that this was placed outside the prostitution quarters. As further evidence to verify this cup as being made by Oishi, I would like to relate an incident which occurred between Oishi and a Satsuma (Kagoshima) samurai by the name of Murakami Kiken. After the seppuku of Lord Asano, those who were aware of the incident expected the ronin to attack Kira but to their dismay, their activities indicated anything but plans for revenge. As you no doubt know, Oishi divorced his wife and spent many nights in the Gion District of Kyoto drinking and consorting with courtesans. Murakami, on his way back from Edo (Tokyo) to Kagoshima, was invited by Oishi for a drink. During the time, he spent with the chamberlain, Murakami tried to anger Oishi into action by insulting him but to no avail. Before he left, Oishi presented him with a sake cup which he had made but upon reading what was on it Murakami was angered further by this seeming contradiction in behaviour to the message. He apparantly threw the cup at Oishi and left. According to accounts that I have read, it was a similar cup that you have in your possession! I don't believe it is the one given to Murakami. It was usual for artists to make several copies of the original design. the 47 men buried there, but a postcard bought from the temple clearly shows Kiken's headstone. Your cup helps to verify the incident between Murakami and Oishi in Kyoto and as such is a very important piece of evidence. I would appreciate any further information that you can shed on your family's history to the original recipient of the cup and how and when your family arrived in Hawai'i. With your permission, I would like to include this in our display and the exhibition catalogue. Once again, please accept my thanks for you and your family's support. I will keep your apprised of the progress of our catalogue and exhibition. Hope that I wasn't too optimistic about the Oishi document. After sending a fax copy to my mother and discussing the document, more questions than answers resulted due to our poor memories. Since my dad passed away without telling us the details, we had a hard time coming to any verifications. She did have some problems reading the entire document since it is in old, poetic type brush characters. Oishi is in the very right line in the document. She thought that Mrs. Yamamoto, who is into poetry, might be able to read the document. Anyway, it may be a document that explains the lacquer dish given by Oishi or may be written by him. We are still very interested in finding out what it says. From what I remember, my father stated that our Terada ancestor was a Asano retainer in Ako under Oishi Kuranosuke, who gave the lacquer dish to him. He remained in Ako and was not directly involved in the revenge. I wish I had more opportunity to talk to him about it. Due to my poor Japanese and his poor English, sadly to say, we did not communicate much. Hope that I didn't jump the gun about the document by relying on my memory. I apologize for that. My mother was able to read the document but due to her limited knowledge of English, could not translate it accurately into English. If my father is correct, it is probably over 300 years old since the revenge was accomplished in Dec 1703. According to him, the dishes with the document were given out by Oishi to his men. That is just absolutely fantastic! You have something that directly links us to Oishi himself. Guard it with your life. And I will be absolutely happy with any reasonable facsimile of it. I will do the best I can, but I doubt that I can do much if your mother was unable to figure it out. But I know I can find people in Japan who can do it (and maybe pay US good moneyfor the privilege). It is absolutely out of this world that you would bring the subject up at this time. This is probably exactly the time in December when everybody turns out to Sengakuji in Shinagawa to pay their respects to the 47 ronin. When I get there at the end of this month, I will go down again, remembering them, our antecedents, and the late Rep. Sidney Yates who also remembered them. Oishi Kuranosuke was the leader of the 47 Ronin after their lord, Naganori Asano-Takuminokami, was ordered to commit seppuku. On March 14, 1701 (during the Tokugawa Shogunate), Lord Asano superficially wounded Lord Kira with his sword in the Edo Castle after Lord Kira had taunted Asano. Shogun Tsunayoshi ordered Lord Asano to commit seppuku. His 321 samurai retainers were ordered to disband, becoming ronin or warriors without a master. Oishi Kuranosuke, Asano's chief adviser, and 59 other samurai left the castle before the Shogun take control of the castle at Ako. They hatched a plan to avenge their lords disgrace by killing Lord Kira. For nearly two years they waited, disguised as merchants, street vendors and drunks to get information on Kira. Oishi would allow only 46 of the men to join in the attempt. On the Dec. 14, 1702, the ronin overpowered the Kiras guards and killed Lord Kira. They dedicated Kira's head to their lord's grave. The Shogun Tsunayoshi was faced with a dilemma: supposedly being sympathetic to the ronins act of loyalty but facing the requirements of the law. After deliberating, the shogun ordered Oishi and 45 ronin to commit seppuku. The youngest one was to be spared. This is the initial translation of the names of the 47 Ronin. The names are difficult to read and may require correction later. The youngest member was only 15 years old; oldest, 76. I'm a spring chicken. It was too crowded in Tokyo at year's end to go down to Sengakuji, the temple they are remembered in. 1. Oishi Kuranosuke Yoshio, 44 yrs. 2. Yoshida Chuzaemon Kanetora, 62 yrs. 3. Hara Soemon Mototatsu, 55. 4. Kataoka Goemon Takafusa, 36. 5. Mase Kyuidaefu Masaaki, 62. 6. Onodera Junai Hidekazu, 60. 7. Hazama Kihei Mitsunobu, 68. 8. Isogai Jurozaemon Masahisa, 24. 9. Horibe Yahei Kanamaru, 76. 10. Chikamatsu Kanroku Yukishige, 33. 11. Tomi Morisuke Emon Masao, 33. 12. Ushioda Matanojo Takaatsu, 34. 13. Hayamizu Tozaemon Misutora, 39. 15. Okuda Magodaiu Shigemori, 56. 16. Yada Goroemon Suketake, 28. 17. Oishi Sezaemon Nobukiyo, 26. 19. Horibe Yasube Takeyasu, 33. 20. Nakamura Kansuke Masatatsu, 44. 21. Sugaya Hanojo Masatoshi, 43. 22. Fuwa Kazuemon Masatane, 33. 23. Kimura Okaemon Sadayuki, 45. 24. Semba Saburoe Misutada, 50. 25. Okano Kineimon Kanehide, 33. 26. Kaiga Yazaemon Tomonobu, 53. 27. Otaka Gengo Tadao, 31. 28. Okajima Yasoemon Tsunetatsu, 37. 29. Yoshida Sawaemon Tanesada, 28. 30. Takebayashi Tadshicki Takashige, 31. 31. Kurahashi Densuke Takeyuki, 33. 32. Hazama Shinroku Mitsukaze, 23. 33. Muramatsu Kihei Hidenao, 61. 34. Sugino Toseiji Tsugufusa, 27. 35. Katsuta Shizaemon Takeaki, 23. 36. Maebara Isuek Munefusa, 39. 37. Onodera Koemon Hidetomi, 27. 38. Hazama Jujiro Mitsuoki, 25. 39. Okuda Sadaemon Yukitaka, 25. 40. Yatouemon Shiki Norikane, 17. 41. Muramatsu Sandaifu Takanao, 26. 42. Mase Magokuro Masatatsu, 22. 43. Kayano Wasuke Tsunenari, 36. 44. Yokokawa Kanbei Munetoshi, 36. 45. Mimura Jirozaemon Kanetsune, 36. These were the actual members who undertook the vendetta attack and were compelled to commit ritual suicide. The 47th member, Ashigaru Terasaki Kichiemon, was ordered by Kuranosuke to remain behind (and remain alive) to tell the story of the adauchi. We are connected to it in so many ways. It is a compelling story that will be adapted.